General Maxwell Taylor, chairman of the Joint Chiefs of Staff, meets with President Ngo Dinh Diem. 1. US flag flying outside the US embassy. 2. Guard in a corridor. 3. Diem walking. 4. Taylor, US ambassador Frederick Nolting, and Diem. 5. Diem shakes hands with General Paul Harkins, US commander in South Vietnam. 6. Diem meets Taylor, shakes hands, then both sit down. General Harkins is also seated at left. 7. Overall shot of room. 8. Houseboys bring in tea and cigarettes. 9. Diem and Taylor. Chicago: “Vietnam: A Television History; General Maxwell Taylor, President Diem Meet,” 09/14/1962, WGBH Media Library & Archives, accessed April 22, 2019, http://openvault.wgbh.org/catalog/V_A5C4B1D955E746EFB648C6A54A0AEC37. 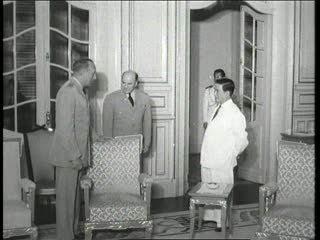 MLA: “Vietnam: A Television History; General Maxwell Taylor, President Diem Meet.” 09/14/1962. WGBH Media Library & Archives. Web. April 22, 2019. <http://openvault.wgbh.org/catalog/V_A5C4B1D955E746EFB648C6A54A0AEC37>.